Bear Raid - What Does It Mean? 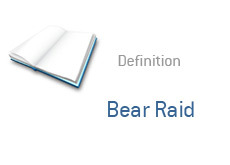 What is a Bear Raid? A "bear raid" is when short-sellers conspire to push down the price of a stock through coordinated short-selling or the spreading of false rumors (or both). Coordinated short-selling "attacks" and the spreading of false rumors are both considered to be manipulation by the SEC, and both acts are considered illegal. Example: The "Emulex Scam". In 2000, Mark Jakob released a fake news story on the Internet Wire news service regarding Emulex. This "press release" claimed that the CEO was resigning, that fourth quarter earnings would have to be restated and that the company was under investigation by the SEC. This was a blatant "bear raid" that was orchestrated by one person, Mark Jakob. Jakob sold shares in Emulex short before disseminating the fraudulent news release, and profited between $230k and $240k when all was said and done. Jakob didn't cover his tracks well, and was arrested shortly thereafter. Example: Members of an online chat room decide that they are going to band together to short the shares of an illiquid stock to drive the shares lower. They are then going to post false rumors about the stock on various investment message boards, hoping to create a panic that allows them to cover their short positions at a profit. Again, this is illegal manipulation and is not tolerated by the SEC. Will Morgan Stanley / MUFG (Mitsubishi UFJ Financial Group) Deal Go Through as Planned?